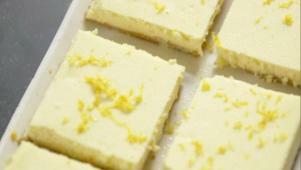 Ina Garten's cutting straight to sweet with delicious make-ahead and very professional fruit desserts. 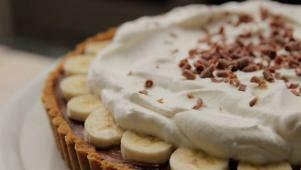 There's a twist on a classic with Apple Pie Bars, then pure comfort meets wow factor in Chocolate Banana Cream Pie. Easy and elegant Stewed Rhubarb and Red Berries make a perfect summer dessert, with ideas for amping things up with fruit liqueurs. Finally, there's a Sparkling Grapefruit Granita that's guaranteed to impress. Ina foregoes traditional apple pie by turning it into tasty dessert bars.